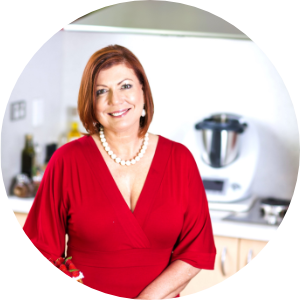 Tenina Holder and any associated companies, have no license from or association or sponsorship with Thermomix in Australia PTY LTD, Vorwerk AG, and none of the recipes that appear here are tested or approved by them. The Thermomix logo is a registered trademark in Australia, owned by Vorwerk International AG. Any thoughts expressed on this site are the authors own and are not sponsored by products unless clearly stated. “Thermomix’ is a registered trade mark of Vorwerk International AG (Vorwerk) in Australia and New Zealand and Thermomix in Australia PTY LTD is its sole authorised distributor in Australia and New Zealand of Thermomix products. Neither Vorwerk nor Thermomix in Australia PTY LTD sponsors, approves or endorses this website or related websites or is affiliated in any way with or approved by Vorwerk or Thermomix in Australia PTY LTD. Neither TIA PTY LTD nor Vorwerk has granted a license to Tenina Holder to use the Thermomix trademarks. Thank you for accessing our website located at www.tenina.com (‘the Website’). The Website is owned and operated by Tenina Holder of Western Australia (‘TH’). TH grants to you a limited, revocable right to access and use this Website and print pages therefrom for personal, non-commercial or informational purposes only. Copyright in all content contained on this Website, including but not limited to text, drawings, photographs and page layout, subsists under, and is protected by, the Copyright Act 1968 (Cth) and international copyright laws and, unless stated otherwise, is owned by TH. Except as permitted under these Terms and applicable laws, no part of this Website may be otherwise reproduced, adapted or transmitted in any form by any process without the specific written consent of TH. Unless otherwise indicated, the trade marks appearing on the Website are registered trade marks of TH. Any use of these trade marks without the prior written consent of TH is a breach of the Trade Marks Act 1995 (Cth) and relevant laws in other countries and is expressly prohibited. The Thermomix logo is a registered trademark in Australia, owned by Vorwerk International AG. TH has no association or sponsorship with Thermomix in Australia Pty Ltd, or Vorwerk International AG. None of the recipes which appear on this site have been tested or approved by either of those parties. TH grants to you a limited, revocable, non-exclusive right to create a hypertext link to the home page of the Website, provided that TH is notified of, and approves, such hyperlink and such hyperlink does not portray TH or her products in a false, misleading or otherwise illegal or offensive manner. You may not make any part of the Website available as part of another website by use of inline imaging, framing technologies or any other method of incorporating parts of the Website into another site without the prior written consent of TH. Any thoughts expressed on this site are the author’s own and are not sponsored by any particular company unless clearly stated to be so. The Website may contain links to third party information and products. You should be aware that such content and links are not owned, operated or maintained by TH nor are they affiliated or associated with TH in any way, unless indicated on the external site. TH is not responsible for the content of any third party material appearing on the Website or any third party sites linked to the Website. Such information, advertisements or links are purely for information purposes only and are not endorsements of the third party information or sites by TH as to their quality, accuracy or completeness. If you decide to access any of the third party services or websites advertised or linked, you do so entirely at your own risk. As far as lawfully possible, TH accepts no liability or responsibility for the actions or omissions of users of the Website or linked sites in relation to the content contained therein. Subject to its legal obligations with respect to privacy, any material, information or testimonials submitted to TH and posted on the Website will be considered as having been voluntarily submitted for use by TH and as non-confidential and non-proprietary information and TH is free to use such information on the Website and otherwise in its sole discretion, whether for commercial or non-commercial purposes and without liability or compensation to any person or entity. While TH takes all reasonable care to include accurate and up-to-date information on the Website, the information provided should not be relied upon as being error free or accurate. TH makes no representation or warranty as to the timeliness, accuracy or completeness of any such material, nor does it accept any responsibility arising in any way for errors or omissions. As far as lawfully possible, TH accepts no liability or responsibility for the actions or omissions of any users of the Website in relation to the content contained herein. All information provided on the Website is provided “as is” without warranty of any kind, express or implied, to the fullest extent possible under law. In no event will TH be liable to any party for any direct, indirect, incidental or consequential damages or losses whatsoever arising from access to or use of or downloading or information from the Website, including, without limitation, damages for loss of profits, business interruption, loss or information or damage to systems due to viruses or other harmful components. TH is not responsible for deletion, failure to store, misdelivery, or untimely delivery of any material accessed through the Website or external sites and will not be liable for any damages or losses whatsoever resulting from any users downloading or accessing of any information or material through the Website. TH reserves the right to revise, change, modify or delete the content of any part of the Website, including any product available through the Website, at any time in its sole discretion and without prior written notice. TH does not accept any responsibility or liability whatsoever for any interruption or discontinuance of any or all functionality of the Website (including hypertext links to external sites if any) for any reason whatsoever. TH reserves the right to revise, change or modify these Terms at any time by posting new Terms on the Website. You are bound by any such revisions and should therefore visit the Terms each time you visit the Website to review the current Terms by which you must abide. If any product is sold from time to time via online ordering facilities on the Website, such sales will be governed by TH’s Terms of Sale specified on the Website as applying thereto. This Website is controlled by TH from her offices within Western Australia. These Terms for use of the Website are governed by the laws of the State of Western Australia. If you choose to access and use the Website from other locations you do so of your own initiative and are solely responsible for your compliance with applicable local laws.